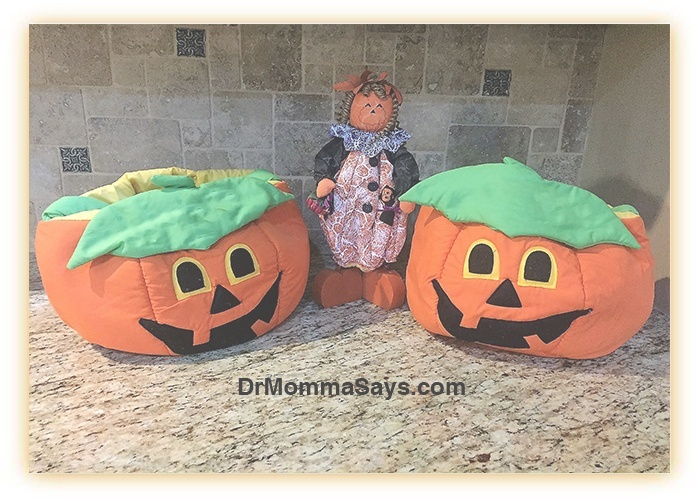 Mom survival mode is a level of motherhood most of us reach at one point or another. Everyone has heard the phrase “Momming Ain’t Easy”, but I promise that phrase does not describe half of the battles that mothers face! Between family pressures, social media expectations and peer pressure, mothers constantly ride the parenting roller coaster of decision-making. Moms experience many days filled with anxiety about decisions that should or should not be made. Mom survival mode can be emotionally, physically and mentally exhausting. Some moms do not know they are in it because they are too busy trying to “fix the world” to make it the way they believe it should be. A vicious cycle ensues. The key is to recognize you are in mom survival mode and figure a way out. What is Mom Survival Mode? Basically, mom survival mode occurs when mothers struggle on a daily basis to live up to society or self-imposed expectations of what motherhood means. Deep down, we understand that each woman is different and can raise her children differently, but somehow we begin to obsess over certain aspects of parenting and lose the joy of motherhood. Newborn anxiety develops into the terror of raising toddlers. The choices for nutrition and education are a constant decision process, and then you have to deal with peer pressure from your child’s friends as well as their parents. Peer pressure may be good but it still forces you to think about a possible personal failure in accomplishing a goal. You may be a working mom and struggle with work-life balance. Eventually, you will obsess over your child seeking independence and may have trouble letting go. Motherhood can be all-consuming. But it does not have to be. It should not be. Mom survival mode might result from a massive collection of daily events and circumstances that leave you feeling like you are not yourself. Like you are going through the motions of life but not fully engaged. 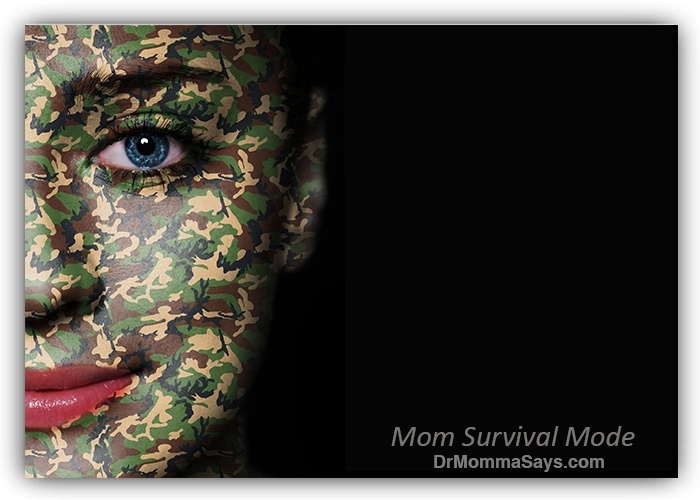 Most of us have had these overwhelming days; however, to deal with them, you must put on your Momma camouflage gear with war paint, then go on the attack! Like many of you, from the moment my pregnancy was confirmed, I sought to be the best mom possible. I read pregnancy books cover to cover, obsessed over naming my children by reading too many baby books, and of course, I read more than my fair share of child psychology books. Soon the information began to be conflicting. So, is there a best answer? The short answer to that question is: NO! Let me just tell you now…ultimately, it is simply up to you. Read things. Digest them. Then make your own solution. Remaining stuck in the decision-making process encourages life to be fixed in the mom survival mode. My husband and I started on the straight and narrow path of “parenting perfection” and then this thing called “life” kept tossing us curve balls. Soon the curveballs were coming faster and faster, and eventually, instead of hitting them away, we found ourselves ducking and covering! In the trenches under fire, we made urgent decisions because there was no time for analysis. Later, we would look back and either high-five each other for a job well done or cringe and shake our heads saying… but we survived. I researched and planned to use cloth diapers and homemade baby foods. Then I came home from the hospital and those temporary disposable diapers became my best friend. I was too overwhelmed with my new life to worry about how I was contributing to the landfill problem. As I struggled with breastfeeding and thought about returning to work after 3 months, the idea of making baby food was a distant memory. Hello, Gerber! No shame. No guilt. But I know many moms who still obsess over their inability to follow through on their initial planned course of action. Let it go. Do not stick with a plan because you made it, stick with it because it works for you and does not add new stress to your life. These decisions do not impact how successfully you will raise your child. I easily accepted my own decisions about changing my plans, but I was fully unprepared for others to force a change. When my child was a few months old and I was feeding her store purchased baby food, slowly advancing on the schedule recommended by her pediatrician, I happily embraced the idea that table food should not be introduced until later in life. Then, the fateful day happened when I walked in to see my mother, precious Nana, chewing food and placing it in my baby’s mouth. Stunned silence. What to do? I did it to you and you are fine. True. But that is old school. The world is smarter now, and we have better ideas. (These thoughts I said to myself because that is NOT something you are supposed to say out loud to your own mother!) However, in my private practice, I have witnessed knock down drag out fights between family members who disagreed on a topic. I understand as a mother that you should make decisions, but you also need to consider the alternatives to fighting with family. Once I caught my breath and saw my baby was not poisoned, I chose to move forward and leave that battle alone. I would not feed her table food, and my mom would not feed her table food in front of me. She knew my desires but there was no benefit in stalking her to see if she followed my rules. There are bigger battles that will have bigger consequences. I suggest you voice your desires and move on. There must be some gene in my family where defiance runs deep. While I was waiting for a magical age recommended by my child’s pediatrician before beginning table food, I was absolutely clear that sugary foods were off-limits. Why? Because I had read somewhere that it was important to avoid sugar before age 1. It made sense to me, so I owned it like it was the law. Imagine my shock when I found out that my sister, who has no children, secretly gave my precious sugar-free baby some chocolate ice cream! At 6 months of age. Of course, she did not tell me. In fact, she tried to hide it, but the brown stain on the baby bib was kind of a giveaway. Next came that familiar family shrug with a casual explanation: But she liked it. Once again, I was faced with two choices. I could lose my mind over an arbitrary rule I made and fight to the death over my choices not being respected. Or I could let it go. My sister is family for life, and she is not a regular babysitter. Once again, I voiced my decisions and crossed my fingers that she would listen. This was not a battle worth tipping me into mom survival mode. I soon recognized that many people in the future were going to make decisions that I would not make. I learned that if I was going to keep my sanity, I would have to reserve my gladiator fighting skills for things that have potential harm. Make a list of 3 things to accomplish for the day. Then celebrate every night when you complete your list. Of course, we have more than 3 things to do but put your most important ones at the top and understand that if you do not complete anything else, today was successful! Honestly evaluate situations to decide if the outcome is worth worrying about. I suggest that you lessen your own burden and resist fighting over things that are not actually carved in stone. Save some of your anxiety for the things to the come that really do matter. I have a new favorite saying that I wish I had known when my kids were young. I learned it a few years ago from a close friend’s daughter, who is an elementary school teacher. She learned these “tough love” words to help her students who decompensated over daily drama and had frequent inconsolable meltdowns. Having tried many methods to resolve the behaviors, she learned to listen to the child through their tears and then she would calmly ask: But did you die though? Sounds harsh but I loved it! I can absolutely appreciate the displeasure many parents would have with this approach, but it is real life. You can choose to spiral out of control when things do not happen the way you want it to, or you can embrace the fact that the outcome is not the end of the world. Accepting this mantra may lessen many parenting stresses! You are not and never will be perfect. Everyone falls off that coveted perfect path and blazes their own new trails through the jungle of child rearing. Learn to embrace situations you never knew could exist. Stop trying to force family and friends to parents your child the way you do in every aspect of life. You should emphasize some rules that are non-negotiable, the ones you will fight about. But those should probably not be about drinking juice! Kids thrive in diversity. I can tell you from my office interactions that moms obsess over telling grandparents what to do when they babysit. When grandparents come alone, they tell me that they are not doing it. But “ssssh, don’t tell her mom”. If you have a shorter list of demands for babysitters, it might be easier to follow. Understand that every decision you have made has been made by millions of women before you. There is no correct answer. Do not second guess yourself. Decide and move forward. Life gives you the opportunity to repeatedly make new decisions. No need to beat yourself up over an old one. Understand that your previous decisions allowed you to develop into a person who can make the new decision. Limit your regret over decisions. Learn to laugh at your mistakes. You will also be able to share that trait with your child. Teach them to not obsess over their decisions or failures. New opportunities for different decisions are available for both of you. Let your kids see you accepting your flaws and finding joy in them. I don’t cook well. I tried, but it was not very interesting to me. My daughters learn that I will burn up food because I get bored in the kitchen and leave. Next thing I know, I smelled burnt food! My girls learned to open the patio door and fan the smoke. I should be ashamed, but you really need to “ball and chain” me to the kitchen to watch food cook! As they grew up, they learned to find me every so often and remind me that I was cooking. We ordered take out on many occasions when my cooking was a failure. We all survived. No guilt. 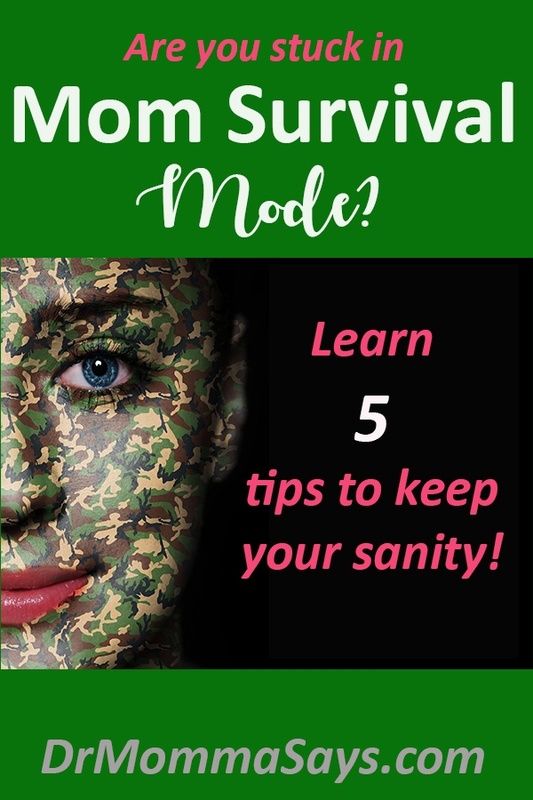 Find what works for you to stay out of mom survival mode.